My gluten intelligence has been on the rise since the Low Summer 2014 issue of Edible East End. I have been nominated as a finalist for the 2015 Eddy Awards in the healthful recipe category. As a proud contributor to Edible East End's What's in Season Column, I have written: Spring Whole Milk Ricotta, Gluten Intelligence (finalist for the 2015 Eddy Awards), Crabbing at Midnight, The Second Harvest and Long Island Latkes. 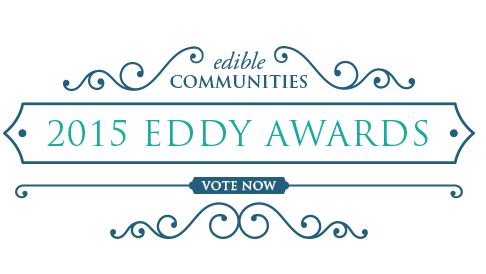 The EDDYs recognize editorial excellence among 80 or so publishers of Edible Communities covering the local food landscape nationwide. A superstar panel of 57 judges; chefs, authors, editors, bloggers, farmers, gardeners, activists and other esteemed professionals in the food world, selected finalists, and now it's up to you to pick Reader's Choice winners. Laura takes us right into her kitchen during her quest to find the perfect marriage of food science and delectable dessert. The beautiful photographs almost make her trials seem effortless. In the end, she triumphed in her journey to make a visually appealing and equally delicious dessert. You'll hardly remember she had to leave anything out! You be the judge! Vote for me and for each category daily through March 15th.